Hello and welcome! I've been meaning to create a blog for...well...a while and after a big ol' career shift that was unexpected, I had some time to really focus and dig in! So for my first official post, I thought I would go big or go home as they say. This master bathroom renovation has been a labor of love, saving and lots of waiting and can I just say the end result makes me soo incredibly happy! I am so in love with how it turned out! If you follow me on Instagram, you know I have been talking about it for months and (hooray! )...its finally done. So, lets get right to it! I know the blogging and social media world loves a good before + after, so here is how she looked before we started. Now, just to give you some background info on the house - its a late 80's/early 90's home and this bathroom was a true testament to that description. I really kinda hated it when we moved in, but we lived with it for almost 4 years and it was fine. Lots of beige, fancy flourishes and brown granite. We did make some minor improvements including a bit of grey paint, new mirrors and some Ikea light fixtures and that helped a little bit. And I realize my before photos aren't the best, but hopefully you can get a sense of what I'm describing. Kinda sad, but functional. I should have turned out those lights! I wanted everything to feel bright and modern, but also classic. Going way too modern would have felt off in this house, so 'classic/modern' felt right. We didn't change the footprint, but ripped every last thing out. Talk about a cloud of dust and dirt! (I'm still finding dust in random places). And can we talk about the view from the tub (and the tub!)? I love how everything feels bright and cool, but also warm and organic from all those hints of walnut and wood in the room. I had a hard time choosing tile at first. 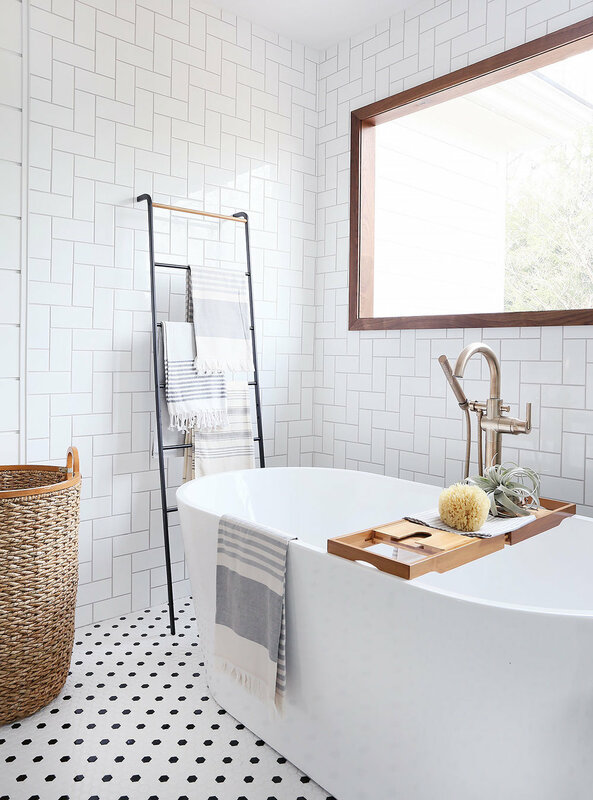 I loved all those beautiful cement tile options out there, but I was worried I would change my mind in a few years and lets face it- renovations aren't cheap especially if you aren't a diy wiz (and uhem..I'm not) so I went with very simple and classic choices. This is my dream shower! My contractor (who is amazing, by the way) did the most incredible job on the straight herringbone pattern tile (and everything else for that matter). 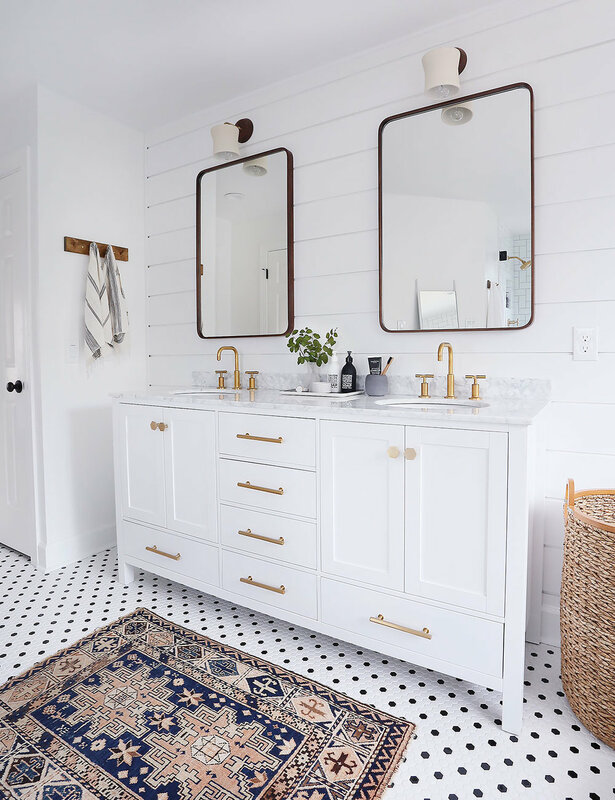 The subway tile plus the brass fixtures just makes my heart sing! And speaking of my contractor, I need to give him a big ol' shout-out because they did such an amazing job with my bathroom. If you live in the Raleigh/Durham NC area, I would highly recommend hiring Hirst Construction for any remodeling needs. The pine shiplap behind the vanity was kinda of a last minute decision and I'm so glad we went with it! I was worried it would feel kinda disjointed and wouldn't flow next to the tile, but in the end it all works together. White on white texture! Yes, please. Let's talk about the vanity. Such a fantastic (and well-made) piece! I got it from Wayfair and I couldn't be more happy with it (plus no assembly!) We changed out the pulls and hardware for some beautiful brass geometric ones from CB2. My only complaint would have to be the length of the pulls (and drilled holes) that came with the vanity (6.5', which is kind of an odd size). My contractor came up with a great idea of adding some brass washers that made up the difference in size and looked seamless. So there you have it! The space makes me happy every time I use it (even in the middle of the night when I stumbling to find the light for the bathroom..lol) Now, I just want to renovate every other space in my home! I did learn quite a bit from the whole process as a designer and a client. It takes a while, so have patience and understanding. Good, quality work takes time and there are things like inspections and plumbing hick-ups that happen. It's messy! Be ready to live in a construction zone and use your kids bathroom for 3 1/2 months! Things won't always go as planned so be ready to adjust. And get a good and reliable contractor! So much this! Ean and his team were amazing to work with and delivered everything they said they would. Plus, they were just incredibly kind, attentive and their work was spot on. *This post contains some affliate links.